The Z-200 glutaraldehyde uses two filters to eliminate troublesome interferences of the sensor system. Measurements are first made with a filter that permits determination of the background or baseline. 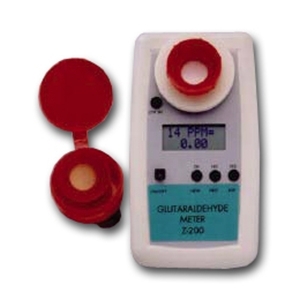 Insertion of a second filter then permits the measurement of glutaraldehyde. The instrument prompts the user for all required actions. The procedure is simple. The instrument prompts the user to insert one filter, remove it, and insert another. With the use of the filter system, interferences are virtually completely removed. Only certain aldehydes and ketones need to be considered. The filters do not permit separations of these classes of compounds. The sensing element of the instrument is an electro-chemical cell. The cell is a four-electrode type, which contains a working and an active auxiliary electrode. The signal from the auxiliary electrode is used for temperature compensation and to improve the selectivity of the entire sensor. The sensor response is linear with the concentration of glutaraldehyde in air.